Urban Fox Orchestra Steelband, aka UFO, is based in the centre of Ealing in West London. 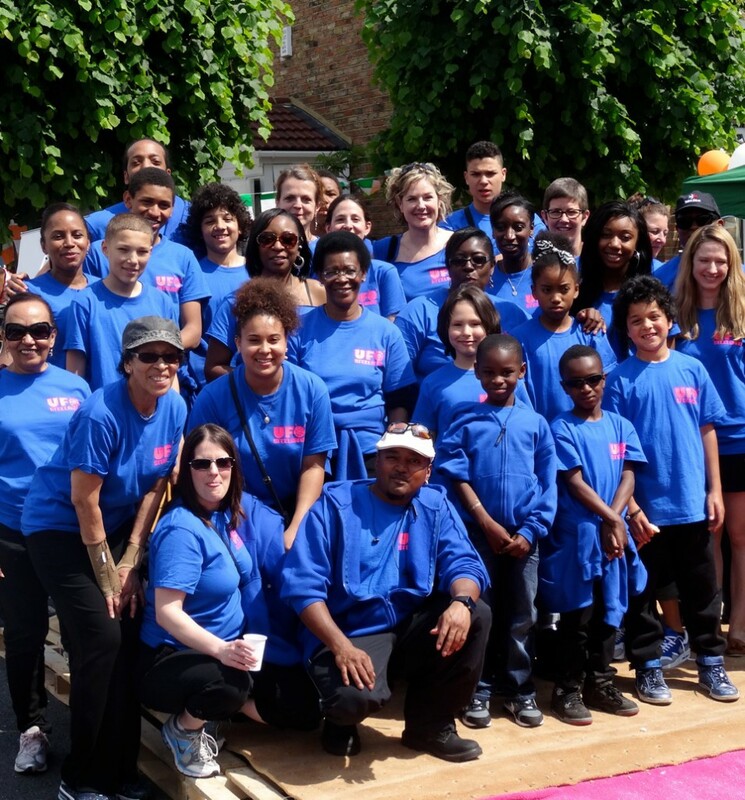 Our aim is to have fun playing pan and sharing the joy of the beautiful steelpan instrument. Led by a film actor, a visual artist, a virtuoso musical arranger and all our players and volunteers, we offer participants of all ages and abilities the transformative opportunity to have music, performance and teamwork in their lives all through the year. Even starting as complete beginners, UFO participants are soon performing all over UK and abroad. 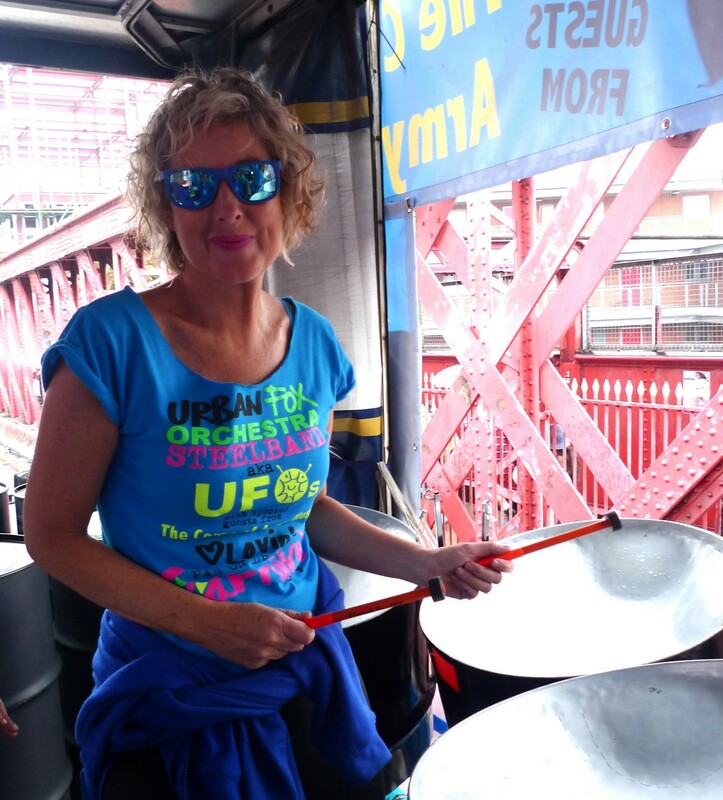 UFO has fast become known as ‘the innovative steelband’. We deliver groundbreaking workshops in the workplace and in education. Our musical arrangements are exciting, our staging vibrant and compelling, and we are the only steelband we know of that teaches the instrument to visually impaired and hearing impaired players, mentored by one of our virtuoso players and founding members who is blind. 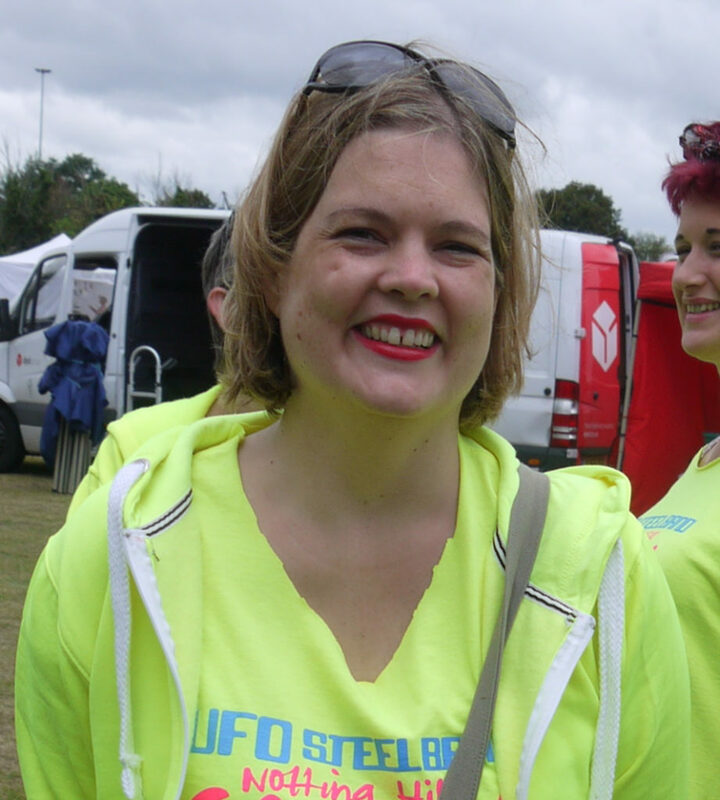 UFO is part of the charity ‘Fox Carnival‘ that ran 20 years of award winning carnival-arts projects, touching over 100,000 young people. Fox Projects put young people’s art at the forefront of some of UKs largest street festivals and resulting artwork has been displayed at The V&A and Tate Modern. Since moving into steelpan we have continued to create new innovations in staging, banner design and the relationship between music and art – View our Gallery here. UFO is always a favourite with audiences at Notting Hill Carnival and The London New Year’s Day Parade. We’ve representied UK in the UAE Cultural Festival in Dubai, and – thanks to the support of Arts Council of England – have created 4 years of exciting workshop and performing projects, playing The Royal Festival Hall to 10 Downing Street. UFOs latest project “Community at Carnival” was supported by the Arts Council of England and created specifically for children in schools local to the Grenfell Tower tragedy. It gave 300 children from bereaved and traumatised primary school classes the chance to be involved in a high-level drawing project, and to have their artwork wrap a 45ft articulated lorry. The project graced the streets of four UK festivals, was one of the highlights of Notting Hill Carnival, and was seen by a further 4 million people on National TV. 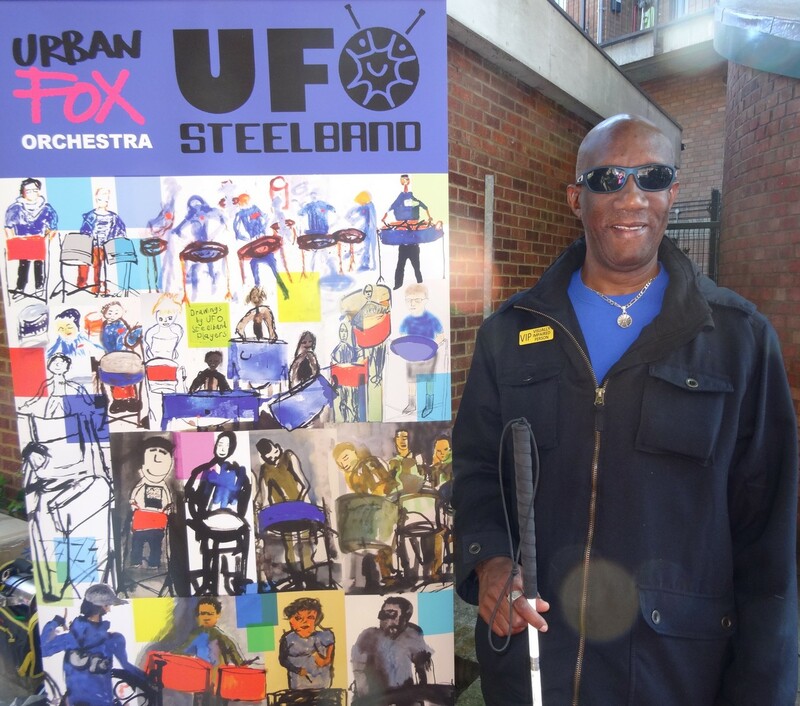 The UFO team are always creating new ways to share the accessible joy of steelpan with new audiences, and to introduce music making to people who never thought they could learn a new instrument. It works, and it makes people smile and that could be you… join us! Musical Director Jason Constantine is a world class arranger and soloist who leads UFOs by bringing his exciting mix of high expectation and incredible patience. The result is fantastic arrangements, wonderful music and many happy people, all thrilled to have pan in their life on a weekly basis. Visual artist and Art Director Fiona Hawthorne led award winning young people’s project ‘Fox Carnival’ for 17 years before falling in love with pan and bringing vision to UFOs. She created and produced ‘One Thousand Pans’ for the closing weekend of the Olympic Games and has new ideas for more. Virtuoso soloist Michael Toussaint has played tenor steelpan all over the world, and now leads the UFO frontline. As the only blind pan teacher in the world Michael also runs the UFO Pilots, our ground-breaking class for blind and visually impaired players. 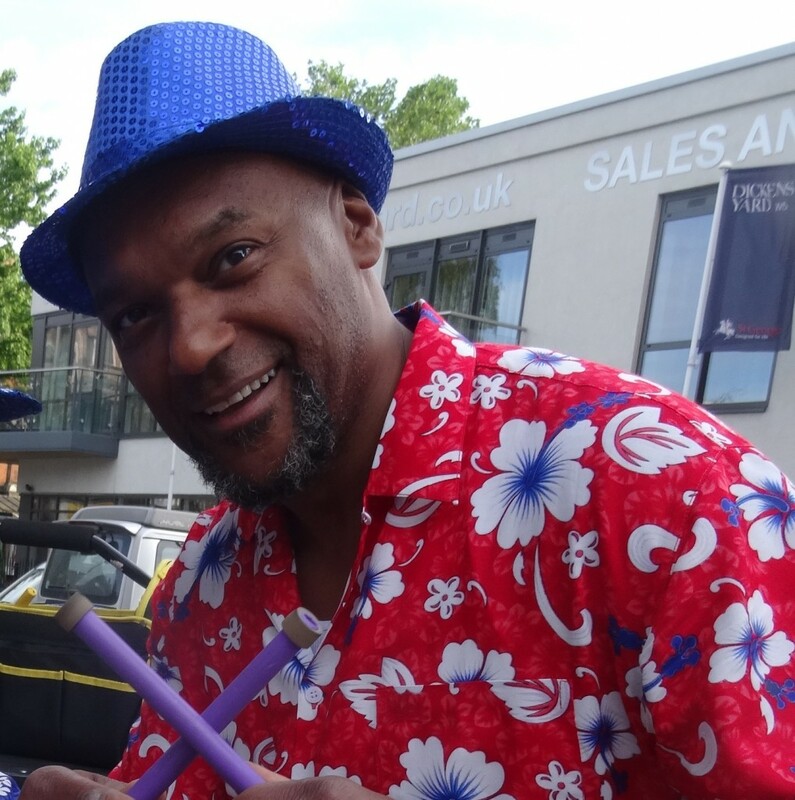 We are lucky that British actor Colin Salmon – when not filming Limitless – shares his wide musical and performance experience with UFO. Colin plays tenor and brings leadership and laughter. 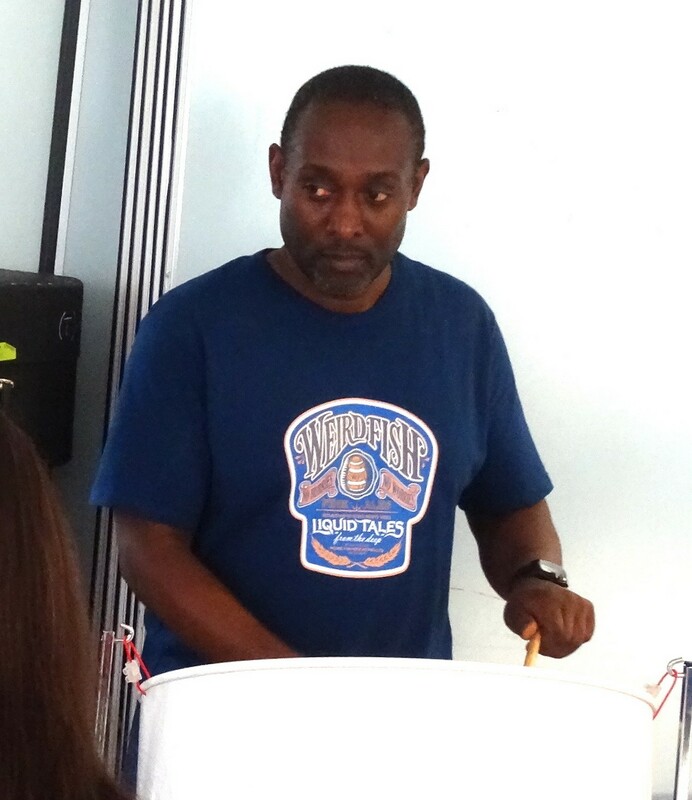 UFOs is a band of amazing people of all ages who come from all over London every week to play steelpan together. The UFO ethos is friendly and welcoming and is all about having fun learning pan. Join us! Andrea is a secondary school assistant head teacher who brings experience around policy, workshops, teaching, learning and working with young people. Once a complete beginner, Andrea has fast become a guitar player with swagger!